I’ve been on a Perfect Strangers kick lately (for the past 10 years)—I even have a stuffed sheep named Dimitri. My love of late 80s/early 90s sitcoms is strong with this one, so today I share with you 6 things you probably didn’t know about Perfect Strangers. Canada’s actual national anthem. I think Mypos wins. Balki did end up singing the Mypos anthem on the show, but sadly it was cut for time. I want to know what gag ran instead! Although not related to the show, both Mark Linn-Baker and Bronson Pinchot appeared in Coke and Pepsi commercials (respectively). 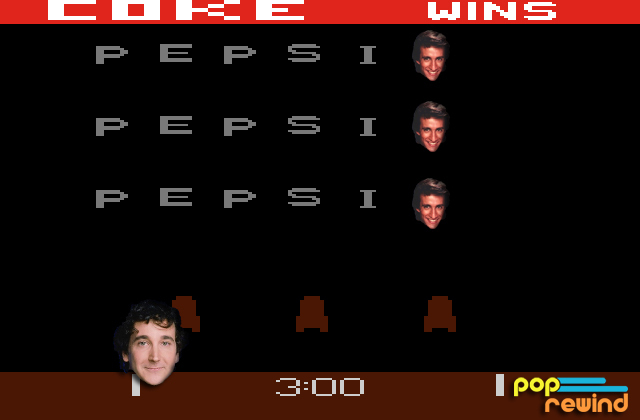 And honestly, the only reason I included that on the list is because I really wanted to PhotoShop their heads onto a still from the Atari Coke Wins game. 4 – Cousin Larry was Almost… Cousin Lou? The chemistry between Mark and Bronson can’t be denied, but Perfect Strangers was almost an entirely different show. In November 1985, Louie Anderson was cast as Balki’s cousin. Work progressed so far with Anderson that they even shot a pilot, but ultimately, producers felt he wasn’t right for the role (or just “didn’t like” him, as he joked on The Pat Sajak Show). Louie’s version of Larry was cynical and jaded. Unfortunately, the pilot has yet to pop up online anywhere. Many sitcoms add a baby or child in later seasons to amp up the ratings. Once this is implemented, a show will take one of two turns: it will be cancelled or the child in question will disappear without explanation. In season six, Tess Holland (Alisan Porter, maybe best known from Curly Sue) played a little girl who lived in an apartment upstairs. After appearing in one episode, she suffered the fate of most hastily-introduced sitcom children. Despite being in the opening credits and even being hired on full-time, Tess was no more. To think, if it weren’t for Larry and Balki, we wouldn’t have Steve Urkel. Let that sink in. After years of watching the TGIF line-up, I had no idea that Family Matters was a spin-off of Perfect Strangers. 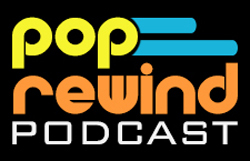 The characters of Harriette and Carl Winslow originated on Perfect Strangers, but there were no direct cross-over episodes. 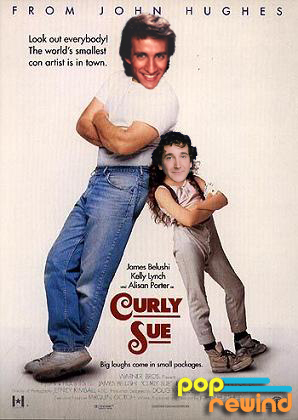 Larry and Balki were slated to appear in the pilot, but were ultimately cut. As was Judy Winslow. I bet this explains everything. Or nothing. I’m not sure. I don’t know any German. It’s completely reasonable for other countries to translate and adapt American television shows to appeal more widely to their new audience. Some changes are going to happen. But the German version of Perfect Strangers, entitled Ein Grieche erobert Chicago (A Greek conquers Chicago), is a gem. In this version, Balki is actually from Greece (where Mypos is now a Greek island). Allegedly, the above video explains that Balki grew tired of his sheep, so he went to America to visit his cousin. That would not fly in my family. Also notable: Balki and Larry speak the same native-accented German. Share with us your love of Perfect Strangers! Leave a comment below! Perfect Strangers did nothing for me. I thought it was boring. i was forced to watch season 1 only because I bought the dvd. Balki’s accent was annoying. I would rather be watching my favahow Threes Company, now thats comedy. I cant believe Perfect Strangers lasted all thoae seasons. Hello. I am Larry. It became too cramped for me at home and that’s why I wanted to move to Chicago to finally have a private life for once. Hello. I’m Balki. It became too boring for me at my sheep in Greece. I wanted to go to America to visit my cousin. After moving around for one year, I finally found him in Chicago.